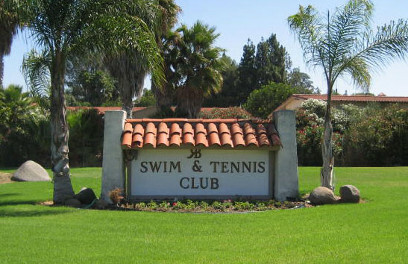 Our Sunday night dances take place at Rancho Bernardo Swim and Tennis Club (sign pictured), located at 16955 Bernardo Oaks Drive, Rancho Bernardo 92128, on the north side of Rancho Bernardo Road between Bernardo Oaks Drive and Pomerado Road to the east. From the north or south: Take Exit 24 from the I-15 south- or northbound to Rancho Bernardo Road. Head east on Rancho Bernardo Road for about one mile to Pomerado Road. Turn left on Pomerado Road and head north; make a U-turn at the first opportunity, and enter the parking lot at the driveway just south of the Rancho Bernardo Community Church. A printable map is available here. See the section immediately below for new parking information. The Management of Rancho Bernardo Swim and Tennis Club have asked that we start parking in the overflow lot on Rancho Bernardo Road and Pomerado Road. The linked photo shows where to park and the location of the new gate. Push the button on the intercom box on the gate and say you are a dancer to be buzzed in. Please note: People who are handicapped or carrying in heavy equipment for the dance may continue to park in the lot located just off Bernardo Oaks Drive. See this aerial photo for a view of the Club's parking facilities. SDECD President: Write to Jimmy Akin at jimmyakin01@gmail.com, or use the icon at left. San Diego May Faire Ball Committee Chairs: Write to Bob and Ann Griffin at ballchair@sdecd.org, or use the icon at left. For musicians who would like to perform for our dances: Write to Judy Cosgrove at judysandburg@yahoo.com, or use the icon at left—or call 858-273-4174. For general SDECD information by phone: Contact David Jacobson at 858-831-9091. Would you like to be on our mailing list? For those who wish to be apprised of SDECD activities and upcoming events, we maintain a mailing list for distributing periodic announcements. To subscribe to these announcements, just email us at mailinglist-subscribe@sdecd.org and let us know—or click the icon at left. Rest assured that we do not send spam, and that your email address will never be shared with any other individual, group, or organization.